No matter what you cook in nature, it adds something extra to the food, and it always tastes better than cooking at home in a kitchen. If you’re backpacking, hiking, at a campsite, or need to make a meal outside your car or van, a propane gas stove can be incredibly useful and versatile. They’re very easy to use, often pack down and become extremely portable, and propane gas is safe to cook with so you don’t have to worry a lot about safety or needing electricity. This is why they’re so popular and used by so many. It’s currently the best way to cook a whole meal outdoors. Of course, you can also use one just to boil some water for your coffee. My wife and I use our portable gas stove outside our RV when the weather allows. We have a griddle we can put on top for both searing and grilling, cast iron pans, and a dutch oven for making those delicious dutch oven potatoes. The versatility and ease of use are why we love our gas stove and is why we often recommend gas stoves to our friends and family when they’re looking to purchase a grill. Instead of a grill? Yes, indeed. Putting a reversible grill/griddle on the stove works great and makes a separate grill unnecessary. Gas stoves come in lots of different sizes, but today we’re going to be focusing on gas stoves for camping and RV life. Some are more stationary than others, but all are very capable stoves that you’re going to love using outdoors. The smallest and most portable stove on today’s list is from Etekcity. This little folding stove can be thrown in a backpack and taken on a hike or used at the campground to cook smaller meals or boil water. It can output 6,666 BTU per hour which will be more than enough to cook a real meal with a small frying pot or pan. My wife and I have one of these, and while we don’t use it as much anymore since we have a bigger stove, we loved having this paired with a 6.5 inch Lodge Cast Iron Skillet. We’ve cooked so many burgers, grilled sandwiches, eggs, and boiled water for coffee with this setup and we only have good things to say about it. As mentioned above, it’s a stove that folds. When folded, it fits into an included carrying case which makes it the ultimate cooking stove for backpackers. When it’s time to cook, you screw the stove onto a butane/butane-propane gas canister and fold out the anti-slip arms which creates an area where you put your pan or kettle. A valve on the bottom will let you control the flame depending on how hot you want to cook your food. Etekcity has put a piezo ignition system on the stove which lets you ignite the gas with the push of a button. This is a small feature that you might not realize how nice it is to have until you get to use one or use a stove that doesn’t have one. Being able to light up the gas without a lighter or matches is extremely convenient. In addition to the 6.5 inch Lodge Cast Iron Skillet, we recommend using a small cook set like the Stanley Camp 24oz. Cook Set with it which is also very compact and portable. 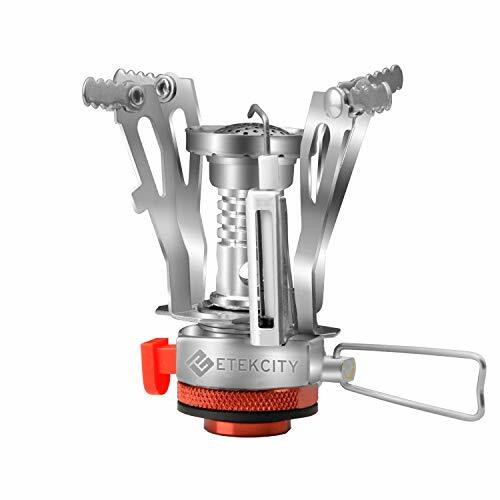 So is the Etekcity Ultralight Portable Backpacking Stove the stove for the stationary RVer? No, there are better options for you that will probably suit you better. Etekcity has made an excellent product for backpackers, hikers, vandwellers, and car campers that need something very portable and compact to cook with due to space and weight limitations. What you have to consider is how big pots and pans you’re going to be putting on top of the stove. Since it’s sitting on top of the gas canister itself, it will seem less steady than bigger alternatives. Of course, none of the more steady choices below are as portable. The stove is compatible with any 7/16 thread single butane/butane-propane mixed fuel canisters (EN 417). Make sure you don’t buy a canister that is only propane as you would need an adapter for that configuration to work. An adapter like the Kovea LPG Adaptor would do the job. Just be aware that propane burns with a bigger flame, so I recommend keeping the flame control on low if used like this. If all you need is one average sized burner to cook your food on, the Gas ONE GS-3400P might be the right choice for you. 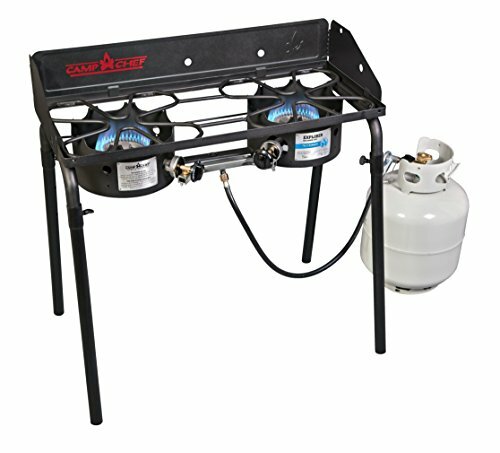 This dual fuel stove can be used with both propane and butane, and it comes with the hose required to use propane. When setting up, you can ignite it with the piezoelectric ignition, so no matches or lighters are needed. The adjustable heat dial will let you control the flame depending on how hot you want your pot or pan to be. Gas One has implemented some neat safety features like an automatic shut off device that shuts off gas flow when irregular pressure or flow is detected. If one of these is detected, a built-in cartridge ejection system will also eject the butane canister for safety. When it comes to pan sizes, I recommend a frying pan up to 12 inches to use with this. With an output of 8,000 BTU, you can cook up a big meal on this portable stove. What we like about the Gas ONE GS-3400P except for all of its features, is the fact that it requires no setup. Get it out of storage and put it in the table, connect the gas, and you’re ready to ignite. This makes it perfect for a van or car camper, as long as it’s used in a ventilated area. When done, wipe it off if needed, remove the gas canister, and put it back into storage. It’s one of few stoves on today’s list that requires no additional setup. We also like that a regulated hose is included for use with propane tanks. The unit weighs 3.1 pounds and measures 13.5 by 4.4 by 11.2 inches. A carrying case is included with the purchase for easy transport and storage. The biggest difference when compared to the Etekcity stove above except for its size is that the Gas One will hold bigger and heavier pans without issues with its more stable base. Let’s move on to the bigger camping stoves with two burners or more. Starting with the Coleman Triton+. There is also a Triton without a plus in the name, which doesn’t have the ignition button. Coleman also sells their Classic Propane Stove which doesn’t have a quick ignition button and outputs slightly less BTUs. The Triton+ however, does have an ignition button and can output up to 22,000 BTUs in total, 11,000 from each burner. A feature Coleman calls PerfectFlow keeps consistent temperatures in all weathers and high altitudes. Both flames are adjustable with two rotating dials. When compared to the alternatives on today’s list, Coleman Triton+ handles high winds better with its adjustable wind block protecting the flames. The Camp Chef Explorer down below is better due to its detachable windscreens, but we still like the wind blocks on the Coleman Triton+ since they’re easy to set up and take down. Storing the Triton+ is easy since the wind blocks and the lid fold down and secures with a clasp. It weighs 10.3 pounds and measures 23 by 5.9 by 14 inches. Its size makes it big enough to use both a 12 and a 10-inch pan at the same time. So why go for a stove with two burners? If you’re planning on cooking a whole meal with a side, you’re going to want two burners to do both at the same time. A two burner stove like this is also great for when using griddles, like the Coleman Triton Series Griddle that gives you 145 sq. inches to cook on. We like and recommend the Coleman Triton+ Propane Camping Stove for several reasons. While it’s a two burner stove, it folds down and becomes easy to store and transport. It does weigh 10 pounds, but is so capable with its 22,000 BTU output in total, wind block feature, a push-start ignition, and support for two big pans or a griddle. We believe this is one of the best choices for most campers that need a reliable portable propane stove outdoors with two burners. If you’re looking for the highest quality gas stoves for camping, Camp Chef is it. At least in our opinion. After using an Etekcity Ultralight Portable Backpacking Stove my wife and I decided to upgrade to a Camp Chef. Of course, upgrading to a stationary model from a backpacking one will be a huge upgrade no matter what you end up going with. But we asked friends and family, did our research, and 9 out of 10 told us to get a Camp Chef. So we did. The Camp Chef model we’re looking at here is not the one we bought specifically, but it’s an excellent option as well. It’s called the Ranger II Blind Stove. With a design that looks like an old pool table, it’s a very straightforward product that doesn’t have a lot of frills but is extremely powerful. It’s capable of outputting 34,000 BTUs through its two burners at 17,000 BTU each. It starts without matches and lighters with its matchless ignition, and the flames are controlled with two dials. Camp Chef has placed the burners inside a housing to protect the flames from the wind. Included with the Ranger II is a 5 feet hose so you can connect the stove to larger propane tanks. A big thumbs up to Camp Chef for including this accessory. It weighs 17 pounds and measures 12.5 by 19.5 by 6 inches. Each burner grate measures 8 by 8 inches. We recommend the Camp Chef Ranger II if you want a stove you can take out on a sunny day and cook dinner on. It’s a very powerful, reliable, and functional stove that does the job with high-quality parts. Camp Chef is a company known for its quality camping gear and accessories, and the Ranger II is no exception in that regard. The only thing we’re missing is an included carrying case. If you’re okay with something more stationary that has its own legs and wind guards, check out the Camp Chef Explorer below. 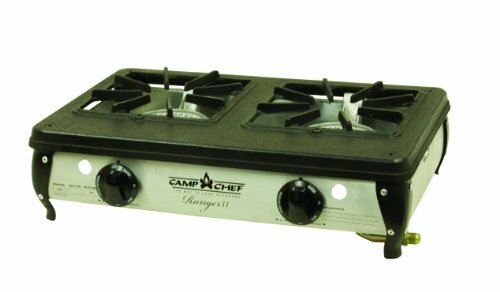 There is also a Camp Chef Ranger model that comes with three burners, click here to see it on Amazon. Next up, the Camp Chef Explorer. If you have ever been to a campsite and walked around, you’ve probably seen one of these. They have an iconic look and design and is the reason that a lot of people call a propane gas stove a Camp Chef although it might be a different brand. Maybe that’s just people in our surroundings! 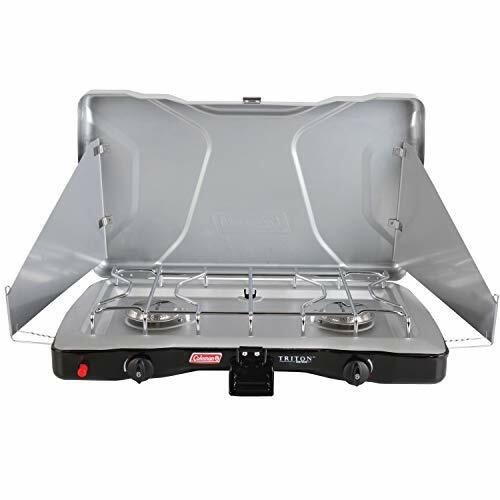 The EX60LW Explorer is a two burner stove that is meant to be used with a large propane tank. A 3 feet hose and regulator is included with the purchase for this purpose. What makes the Explorer models more stationary but also more comfortable to work with in nature is its detachable legs that put the stove up in the air, making it easy to cook with no matter where you are. The legs are adjustable to help level the stove on uneven ground. When it’s time to pack down, the legs come off and go into a storage bag. Unfortunately, there is no carrying bag included for the stove which is a shame. There is one for sale separately, and you’re probably going to want one since the setup weighs 31 pounds in total. Two burners output up to 60,000 BTUs, 30,000 BTUs each and the cooking area measures 14 by 32 inches in total, which is 448 sq. in. A 3-sided windscreen can be set up or not depending on needs, and two rotating dials let you control the flame. Note that there is a three burner stove model as well, click here to see it on Amazon. So what’s good and bad about the Explorer models by Camp Chef? The good is that they’re made with reliable, high-quality parts, has burners that can output impressive flames for all kinds of cooking, and comes with legs to stand on so you don’t need to purchase a table specifically for your stove. The bad is that it’s stationary and heavy, which of course could also be a great thing for the stationary camper that stays in the same spot for a week. We’re also missing a quick ignition button, and a long lighter is required to ignite a flame on the aluminum burners. All in all, the Camp Chef EX60LW Explorer 2 is one of our top 3 picks when it comes to outdoor cooking. We can leave dutch oven potatoes on these burners for an hour, and we know it’s going to turn out great. Reliable and consistent heat is the key when cooking outdoors since the weather can make other stoves unreliable, but we’ve never had that issue with a Camp Chef. There is more to a gas stove than just a burner. Some options are extremely portable, while others are more stationary. Some only have one burner, while others have three. Which product is the best for you depends on what you need and where. Do you need one in your van to boil water in the morning, and cook some noodles at night? Well, then a one burner stove is probably the way to go. If you need one for the family reunion and must be able to cook dutch oven potatoes, while boiling corn, and searing some steaks, at least a two burner is necessary. Sometimes we forget to think ahead about where we’re going to need to use this one product the most, so that’s why I ask these somewhat obvious questions. Good: Camp Chef Ranger II Blind Stove – The Camp Chef Ranger model has a lot going for it, and it’s a heavy contender in this category in several aspects. It outputs tons of heat for lots of cooking and includes what you need to get set up. The stove itself, however, requires no set up except for a connection to the gas tank. Better: Coleman Triton+ Propane Camping Stove – We’re genuinely impressed with what Coleman has achieved with the Triton+. It’s lightweight, portable, stores with ease, is powerful enough to cook dinner, and keeps the wind away from the flame with the windscreen all around it. It’s a robust stove that is quickly set up and packed away, with a quick ignition button, so you don’t have to fight the wind with your matches — all in all, an excellent choice that will satisfy most campers. Best: Camp Chef EX60LW Explorer 2 – The best stove for camping is the stationary Camp Chef Explorer. A big plus is that you won’t need a table to put it on or sit on your knees to get your dinner cooked. Adjustable legs will hold it up for you so you can focus on more important things, like controlling the 60,000 BTU output from the two burners with the heavy-duty rotating dials. It weighs over 30 pounds, but that will also be a good thing when it gets windy outside, as you won’t have to worry about it tipping over. It’s a proven winner that makes the whole camping experience better. What kind of pots and pans can I use on a gas stove? You can use any cookware on a gas stove, but some choices make more sense. When cooking with gas, it heats one specific area quicker than an electric stove, and burners are often smaller than an electric stovetop, so the heat isn’t spread as much. For this reason, I recommend using copper, aluminum or cast iron. Stainless steel is also okay to use on gas when combined with aluminum like with the All-Clad 600822 SS Copper Core 5-Ply Bonded Dishwasher Safe Cookware Set. Is it safe to use a propane gas stove indoors? Most propane gas stoves have a sticker on them saying “not for use indoors.” If this is the case, I recommend following the manufacturer’s guidelines and don’t do it. But “I have a gas stove inside my RV?”, you might say. And yes you do, and so do we, but there is a reason that the manufacturer has put the sticker on the stove. Not all areas have carbon monoxide alarms, proper ventilation, and safety features. While propane gas is a safe gas to work with, it’s important to take safety precautions and follow guidelines. Can I use a large propane tank instead of a small tank? Yes, you can, and the only thing you’ll usually need is a hose with a regulator on it. Like this model by GASPRO. Can I cook with propane when it’s raining? Yes, you can. I recommend wiping off and taking extra care off the stove, hoses, and attachments that can rust if they get wet. Where do I get propane or butane gas? Propane and butane gas cylinders can be purchased in stores or online — both in small and large tanks. If you’re looking for propane to fill up your RV tanks, AmeriGas has a great location finder that you can find by clicking here! Can I refill a small canister of propane gas with a large one? Although a lot of cheaper 1 lb propane tanks are sold and marked as disposable, they can be refilled. What you need is a propane refill adapter like this one from Dozyant. It has a built-in safety feature that will stop gas from overflowing. Directions on how to do it are included with the adapter. The most significant difference between butane and propane is the fact that propane has a lower boiling point than butane. What this means is that it will convert liquid to gas even in cold temperatures. It also exerts greater pressure than butane at the same temperature. 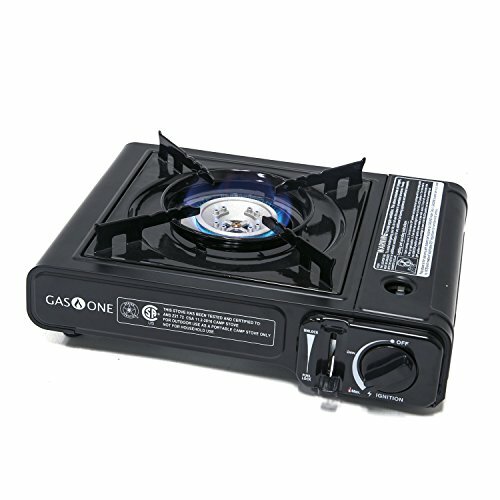 Can I use butane gas or natural gas with a propane stove? It’s often possible with the right adapter; however, I would only recommend doing this if the company advertises that it’s safe to do. If it doesn’t, I suggest contacting the manufacturer and asking specifically about that product. How do I use the propane gas quick connect on my trailer? If your RV has a quick connect to your large propane tanks to use stoves, grills, and fireplaces outdoors, all you’ll need is a connection hose if it wasn’t included with the trailer purchase. Camp Chef sells one that has a 3/8 female fitting, and a type 250 male fitting. It’s made for use with Camp Chef stoves, but it might work with other models as well.